Bought a sheet orange tagboard and a fresh thick nib black felt pen. Then I walked back down the street and picked up 50 unbruised Maple Leaves. Back home. Got out ironing board, wax paper/scissors. Press/hot ironed leaves between the folded wax paper (about 15 seconds) , let them cool down for a 20 seconds, gently, handling by stems, removed and stacked the leaves. Repeated (using fresh wax paper each time) until all the leaves were waxed. Used the leaves for table color at Birthday Party. Cut out a pattern for triangle. Traced on tag board. Cut out enough for H A P P Y 9 0 th. Measures 4 inches from tip of triangle for bottom of letters and 2 inches from top (used pencil to mark). Free-handed each blocked letter lightly with pencil and then outlined and coloured in with felt pen. Folded top edge over, used a ruler to get a sharp bend and a pencil length to rub firmly over the fold to make a crisp fold line. Strung thick twine across kitchen. Used colourful metal clips to hold letters in place. 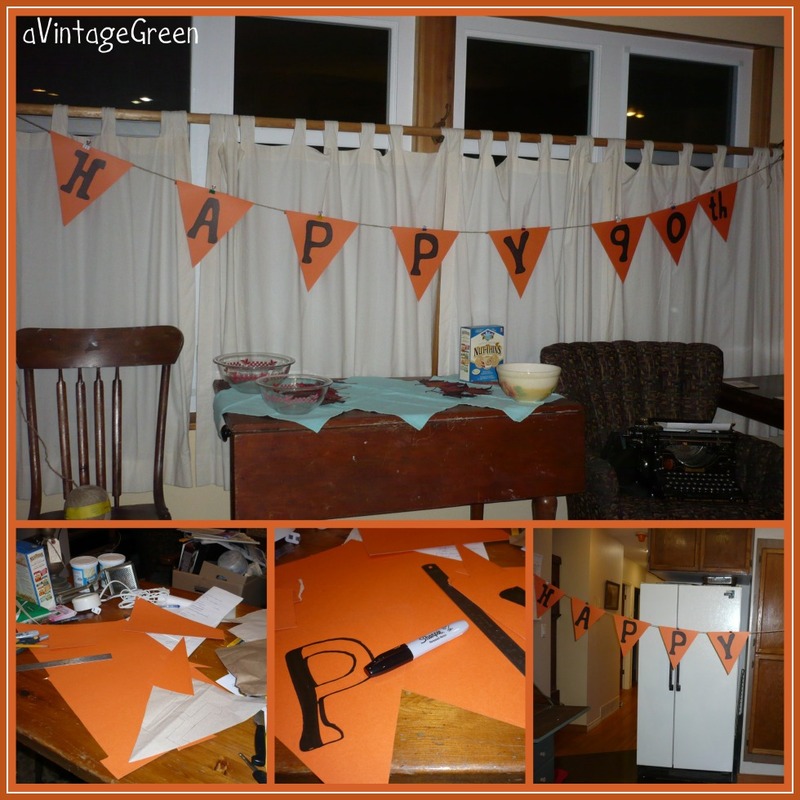 Spaced and moved around the twine until the letters HAPPY 90th looked right. Moved twine banner and strung it across windows in living room. Quick, reusable. Easy to put up and take down. 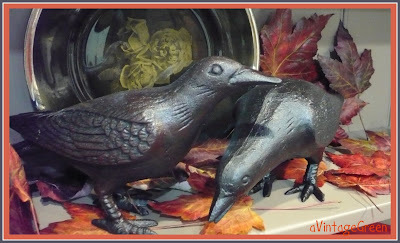 I think these birds will be around for a long time, peeking in to many vignettes over the years. I so admire your beautiful maple leaves! I will have to make do with some sweet gum leaves here. Loved your banner. It is so much nicer to MAKE/CREATE things instead of buying mass produced items! Thank you Linda. I always appreciate your comments. Being a former praire girl I still find the maple leaves a special fall treat. I love the maple leaf idea, us crafters just can't let anything go to waste! I love this idea. What cute Fall decor you have. Thanks so much for sharing with my newbie party. Joy, it is so nice to meet you! I also love crafts and this weeks I will be posting some recent projects I finished. I must try waxing leaves! Maple leaves are so pretty when they turn! What a perfect way to enjoy them! Love the birds too! Found you via Debbiedoo's newbie party & I'm a new follower to your blog. Wow... great idea.. thanks for sharing!! I'm happy to have seen this post. Last year in Canada, I picked up a stack of maple leaves (but some are bruised) and placed them in a book to bring them home. Now I know how to was them! Thanks! 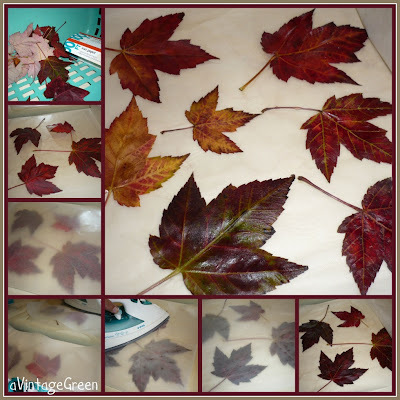 Love the idea for the waxed fall leaves. The banner is perfect ! Visiting from "Sew Many Ways".